So you’ve seen these slightly strange looking multi-coloured toe socks around the studio and even on the internet with celebrities donning them. You’ve probably caught yourself wondering at some point what exactly they do and why can’t you wear regular old socks like you’ve been doing for years. First and foremost, the reason why we recommend our clients to wear socks is for hygiene reasons. With all the walking we do in humid Singapore, we have to say (from personal experience) that not everyone’s feet is in the best condition. So unless everyone can produce a certification of recent pedicures done, we say wear your socks! And we don’t mean the ones you came to the studio in! So how does Toesox stack up next to our good old regular socks? Spreading your toes helps strengthen the feet, increase blood circulation and align mistreated toes. When we do footwork, proper alignment of the feet and toes are important in working all the muscles of our feet. Did you know that there are 26 bones (one quarter of the bones in the human body), 33 joints and more than 100 muscles, ligaments and tendons in the foot and ankle alone! Flat-foot, also known as pes planus, increases with age. Due to the lack of strength and usage of the muscles, ligaments and tendons in our foot, they stop supporting the arch as well, resulting in flat foot and foot aches. By spreading our toes, it helps with the engagement of the muscles in proper alignment. Regular socks draw your toes together making them act as one unit, like a hoof, and…you’re not a horse. Separation of the toes also helps with balance and agility, and you know you need all the help you can get when it comes to some Pilates exercises! Plus, the little dots underneath the socks are actually non-slip! These helps you to have a better feel of the surface you are working on without worrying about sweaty feet or the overly slippy cotton socks! We also love the crazy colours and patterns it comes in. Sometimes, we even try to match our outfits with the socks. 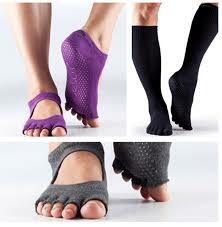 We could go on and on about the many benefits of Toesox but those listed above are the main things we love about them. So now you know why we sell them (and we don’t sell anything we don’t believe in) and have a myriad of them!